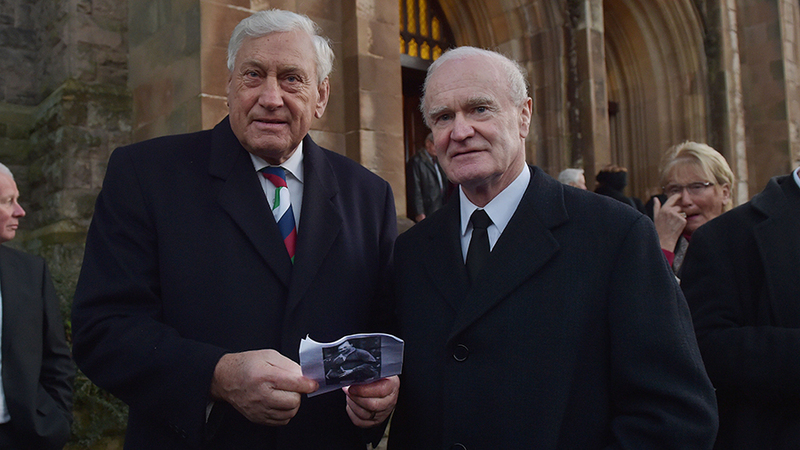 Irish rugby legends have paid tribute to the one considered the greatest of them all as they joined friends and family of the late Jack Kyle at a special thanksgiving service. Ireland and Lions stars Willie John McBride and Mike Gibson hailed Kyle's qualities as a player and a man after attending the emotional event in Belfast. Kyle, who died last week aged 88, was once voted the best rugby player the island ever produced, winning 46 caps for his country and six for the British and Irish Lions, inspiring Ireland to a Five Nations Grand Slam in 1948. The service at Fisherwick Presbyterian Church in Belfast also heard of Kyle's life and achievements off the pitch - about a man who, after hanging up his rugby boots, eschewed the prospects of a glittering medical career in the UK to work as a surgeon in Zambia for over 30 years. Afterwards, iconic captain of the 1974 Lions McBride said he was proud to have called Kyle a friend. "He was one of the great men," he said. "How do you define 'gentleman'? Well, for me it is two words and those are 'Jack Kyle'. "He was just one of the great men of this world and I am just proud I had him as a friend." Gibson said people would be hard pressed to find someone who disagreed with the assessment that the jinking fly-half was the finest player to ever wear the green shirt. "Unfortunately I didn't see him when he was at his prime but I don't think there would be many people arguing with that assessment," he said. "I was with Jack at a dinner when he was named as the best player ever produced by Ireland and he felt embarrassed by it, he felt humbled by it - but that was the nature of the man." A private family funeral for Kyle was held this morning, with the wider public given an opportunity to pay their respects at the thanksgiving event this afternoon at Fisherwick church. Present day stars of Ulster in Rory Best, Tommy Bowe, Andrew Trimble, Craig Gilroy and Iain Henderson were among those who attended, as did former Ireland and Lions great Syd Millar. Stormont's Deputy First Minister Martin McGuiness and 1972 Olympic gold medallist Dame Mary Peters were also at the service. At the outset, Kyle's grandchildren Erin, Jack and Calum carried cherished items to the front of the church that symbolised Kyle's career and life - an Irish jersey and cap; a doctor's stethoscope; and a picture of one of his favourite poets, William Butler Yeats. Kyle's close friend, Reverend Colin Morris, who ministered in the Zambian town where the surgeon lived for three decades, spoke of his principled stand on racial issues. He revealed that he refused to associate himself with all-white sports clubs in the post-colonial country despite numerous requests for the endorsement of the famous rugby player. "He said he had no intention of having any association with any sports organisation that practised segregation," he told the congregation. Rev Morris, who also paid tribute to Kyle's late wife Shirley, added: "They said he had genius and I am quite prepared to believe it but he had something rarer than that, he had goodness." Earlier Rev David Lapsley described him as a "great and good man" who had "dedicated his life to healing the wounds of Africa." After Kyle's daughter Justine read from scripture, his son Caleb thanked all those who had sent messages of condolences in the days since his father's death. "Over the last few days we feel we have been cradled in the arms of the people of Ireland and beyond," he said. "From that we have drawn immeasurable strength."